The Limbe Wildlife Centre is releasing the Grey parrots that were confiscated on Douala Airport. We are experimenting with a soft release method because we want to make sure that the survival of the birds is as high as possible. The idea is to keep a small group of parrots for a short while in a cage on the release site. After a few days the parrots are completely relaxed and they eat well. 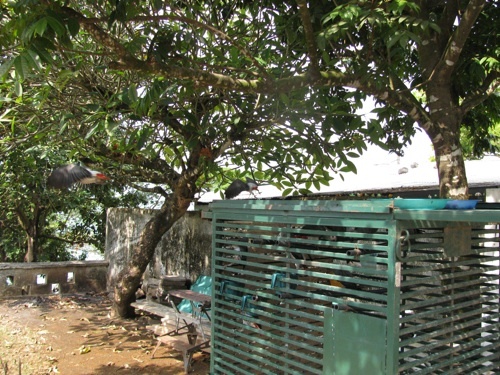 When the cage is opened the feeding will continue, so the parrots can choose either to go or to come back for some more food. The first 24 parrots have been release with this method. All of them flew off immediately and did not come back. The food we leave on top of the cage has been untouched for 3 days. Release successful.